Jerry Springer is an American television presenter, best known as host of the tabloid talk show The Jerry Springer Show since its debut in 1991. He is a former Democratic mayor of Cincinnati, Ohio, a former News anchor and a musician. Springer is dedicated to upholding the freedoms guaranteed by the Constitution. His family saw first hand what happens when those freedoms are denied. And he will fight to keep those rights forever - for everyone. After earning a bachelor of arts degree in political science from Tulane University, Springer received his law degree from Northwestern University in 1968. His first job after law school was working as one of Senator Robert F. Kennedy's presidential campaign aides. After Kennedy's assassination, Springer joined a law firm and moved into the political arena himself. He spearheaded the effort to lower the voting age from 21 to 18, which culminated with his testimony in front of the Senate Judiciary Committee in support of ratification of the 26th Amendment to the Constitution. He was elected Cincinnati's Council-at-Large in 1971, serving five successive terms. In 1977, Springer was elected Mayor of Cincinnati by the largest plurality in the city's history. At age 33, he was one of the country's youngest mayors. Five years later, Springer launched his career in broadcasting as a political reporter and commentator on Cincinnati's WLWT-TV. He became anchor and managing editor in 1984 and was Cincinnati's top-rated news anchor until he relinquished the post in January 1993. During his tenure, Springer received seven Emmy Awards for his nightly commentaries, the forerunner to his "Final Thought," and was voted television's Best Anchor for five consecutive years by readers of Cincinnati Magazine. Of his professional achievements, Springer is most proud of his involvement with Cincinnati Reaches Out, contributing on-site reporting from Ethiopia and Sudan where he documented the effort to provide assistance to famine-stricken Africans. The company that owned WLWT-TV also owned The Phil Donahue Show. One day, Springer's employers took him to lunch and gave him a new assignment: hosting his own talk show. The Jerry Springer Show, a daily, one-hour talk show, premiered on September 30, 1991. During its 8th season, the Jerry Springer Show is seen in more than 190 U.S. markets and is a hit in 40-plus foreign countries. The Jerry Springer Show has become the nation's No. 1 daytime series and the first talk show to beat Oprah Winfrey in more than a decade. For three consecutive years, Springer served as co-host of Jerry Lewis' annual Stars Across America Muscular Dystrophy Labor Day Telethon. Springer also serves as vice president on the board of the National Muscular Dystrophy Association. He says, "It is a privilege to help raise funds for this vital research on behalf of children stricken with these life-threatening illnesses." For several years, he has been on the advisory board of the Audrey Hepburn Hollywood for Children Fund (AHHCF), an umbrella foundation to continue Hepburn's formidable work for needy children around the world. Dedicated to improving the standard of children's education, Springer has established a scholarship fund at the Kellman School in Chicago that serves inner-city youth. Jerry is currently adding the final touches to "Ringmaster," his first book due to hit store shelves in November 1998. Also planned for November is Jerry's first venture into feature films. The as yet untitled motion picture stars Jerry Springer playing himself and features a fictionalized chronicle of the Jerry Springer Show. The film is being produced by Motion Picture Corporation of America. Jerry's video collection has become the hottest selling video nationally and internationally. "Jerry Springer: Too Hot For TV" features clips and out takes from the shows that are too hot to air on national television. This series of tapes has drawn wide-ranging appeal from college students to professional athletes and has sold more than a million and a half copies. Consider that this one-time mayor clowns around with Letterman, Leno and Conan, impersonates Elvis, sings rock 'n' roll at the House of Blues and Johnny Depp's Viper Room, opens for Billy Ray Cyrus on his "Redneck Heaven Tour," provides color commentary for Major League Baseball and suited up to play goalie for the International Hockey League. Yet Springer also dissects serious subjects on Larry King Live, Crossfire, Nightline, and the Today Show, holds the hands of AIDS-stricken children, goes underground with New York's "Mole People" who live in subway tunnels, interviews such notables as George Bush and Jesse Jackson and is the concerned humanitarian helping to raise millions of dollars for charity. Be it lawyer, politician, newsman, author, actor, talk show host, rock 'n' roll singer, they're all Jerry Springer . 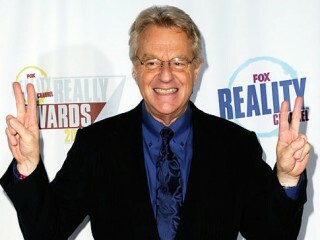 View the full website biography of Jerry Springer.